This 1950s Teak and Metal Side Table is no longer available. Very nice side table, bench or telephone table. This table is made of black lacquered metal and has a teak writing space with a drawer. It is in a lovely original condition. Period, 1950s. Dimensions: H 62 cm, W 78 cm, D 40 cm. Beautiful sewing, side table. This side table with storage is made from teak and pine and is in excellent vintage condition. Period 1950s. Dimensions: H 56 cm, W 40 cm, D 32 cm. Set of two teak wood benches. The solid base in enameled iron, 1960s. Excellent design objects of the 1960s for the decoration of interiors, windows, lofts or simply to create a window. 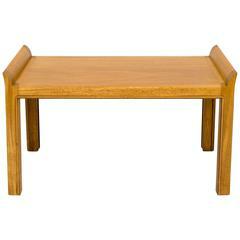 Teak side table designed by Yngve Ekstrom in Sweden in the 1950s. Recently refinished.